dade MILANO is the name of the new kitchen by dade design and this is exactly where it will be presented in April 2018. The Salone del Mobile is the worlds largest venue for design. In the last years, dade design has evolved and set priorities – pointing on quality and the cooperation with selected partners. Visit us on Zona Tortona Milan, Via Tortona 31 from April 17th- 22nd 2018. With the (UHPC) ultra high-performance fiber reinforced concrete dade ROC, developed by dade design, and sophisticated mold making and casting technology, it is now possible to produce almost filigree concrete workpieces. The 10mm kitchen front dade FRONT is on the market since 2017 – for the kitchen dade MILANO, whose body is built from fine walnut wood by our partner company Timberline, we used exactly these concrete fronts. The kitchen block gives the impression of being crafted from a single block of concrete. It was designed by the dade ARCHITECTS and holds some special features such as a BORA Professional, fittings from BLUM (Expando T und Legrabox) and an LED lighting system with sensors from HÄFELE. 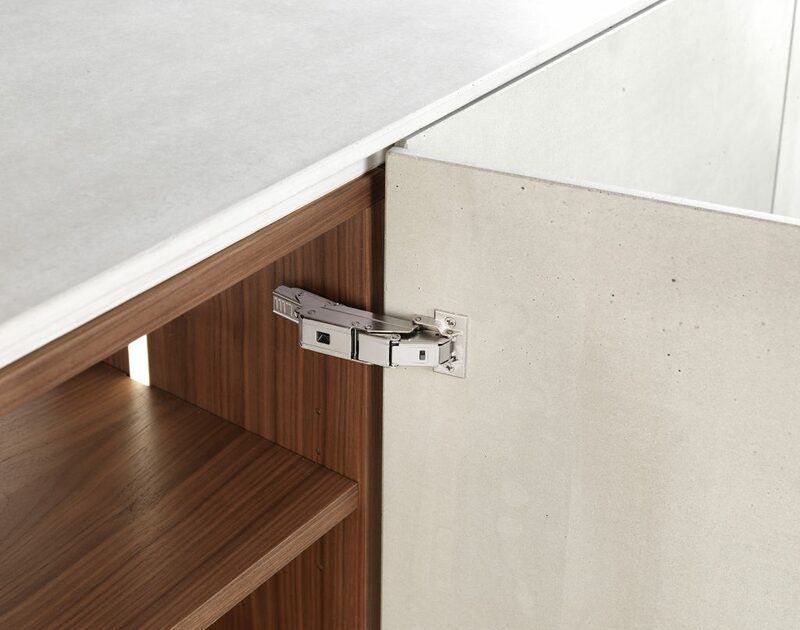 The dade FRONT can also be attached to a cabinet door, a wood drawer or double drawers. In addition to the extra-thin concrete fronts, the dade plant in Altstätten Switzerland also produced the 35mm thick worktop with seamlessly integrated concrete washbasin. 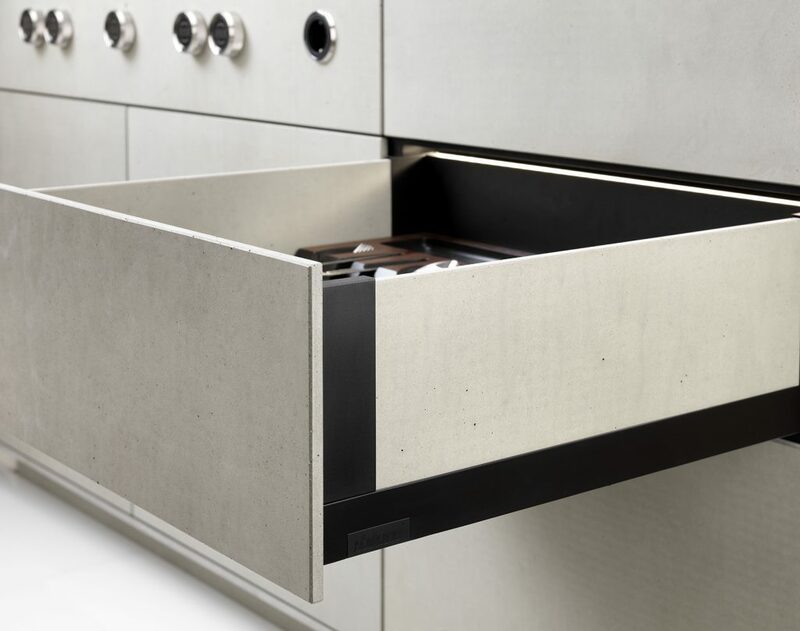 The drawers open almost automatically thanks to Tip-on Blue Motion and Servodrive by BLUM. The concrete surfaces were all provided with the special dade coating, making the kitchen suitable for everyday use. Matching the body, the cutting board made of walnut is a perfect complement and eye-catcher at the same time. The straight-lined kitchen adapts perfectly to different living situations – as a monoblock in modern surroundings, or, as a deliberate contrast in traditional architecture. The dade MILANO can be planned individually – even the integration of a dishwasher is possible. 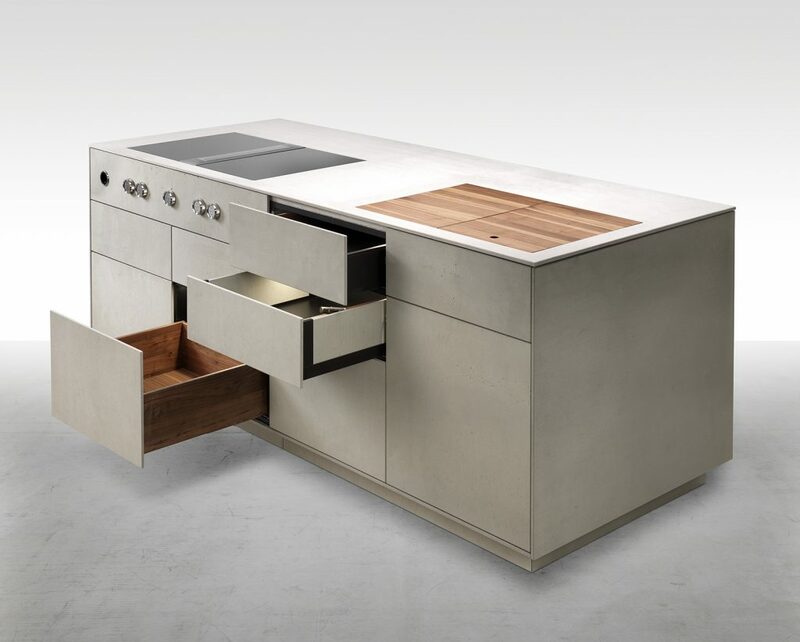 To architects, planners and retailers we offer the possibility to either purchase the complete dade MILANO or to purchase only the raw products (countertop with sink / dade FRONT as raw plate or boxed, drilled and coated) from dade design and then integrate them into a custom kitchen and furniture design. 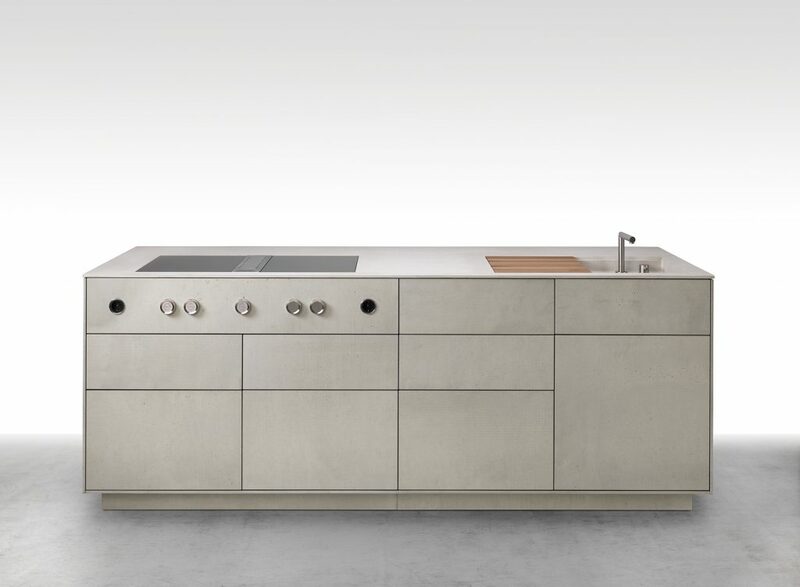 dade design is thus consistently going its own way and once again demonstrates pioneering spirit in concrete design with the swiss made dade MILANO kitchen. During the Salone del Mobile in Milan, dade design is presenting the kitchen dade MILANO as well as a new washbasin collection dade PANEL SHINE, and the new dade ELEMENT concrete washbasin series. We are looking forward to your visit in Milan.